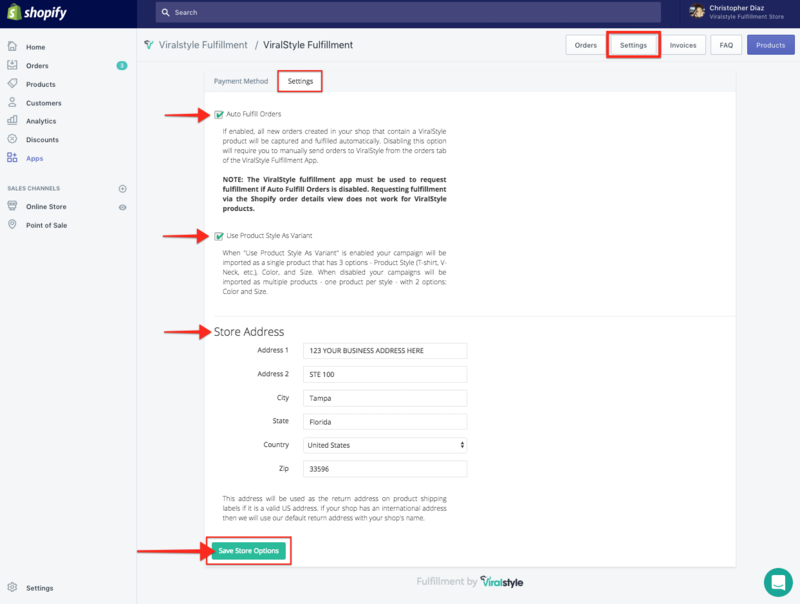 You must add a payment method before you can import/publish products from the Viralstyle Fulfillment app into your Shopify store. Click the "Settings" button (top-right) then click the "Payment Method" tab. You can use a credit/debit card, or PayPal account for billing. 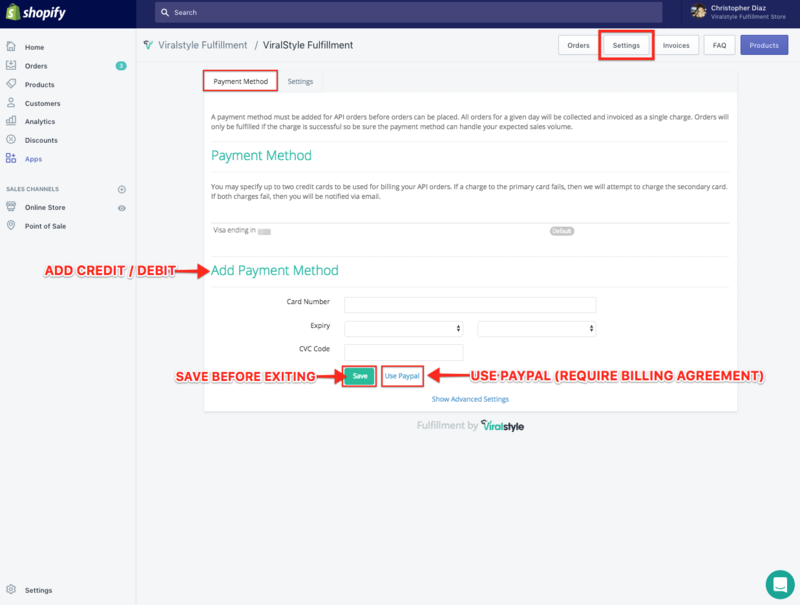 Please keep in mind A billing agreement is required to charge API orders via PayPal. Clicking continue will redirect you to the PayPal website to complete the agreement setup. You will be returned to the app once the agreement is completed. The "additional payment" option is only available if you are using a cc/debit as the payment source. You can then add another cc/debit as a back up. If you'd like to "replace" the cc/debit card, add the new card as a back-up then SAVE. Once you have a primary & back-up card on file, you are able to remove either card option and/or select which you'd like to set as the primary for fulfillment. From the same "Settings" button (top-right), click the "Settings" tab. You will notice that the "Auto Fulfill Orders" setting is turned "ON" by default. If enabled, all new orders created in your shop that contain a ViralStyle product will be captured and fulfilled automatically. If your payment method & customers address(es) have cleared, we'll handle the rest. Disabling this option will require you to manually send orders to ViralStyle from the orders tab of the ViralStyle Fulfillment App. Read the Use Product Style As Variant (UPSAV) tool carefully. When "Use Product Style As Variant" is enabled your campaign will be imported as a single product that has 3 options - Product Style (T-shirt, V-Neck, etc. ), Color, and Size. When disabled your campaigns will be imported as multiple products - one product per style - with 2 options: Color and Size. This address will be used as the return address on product shipping labels if it is a valid US address. If your shop has an international address then we will use our default return address with your shop's name. To learn more about International (out of USA) business owners & policy, see the articles below.